We know that choosing the right dentist for you and your family is an important choice. 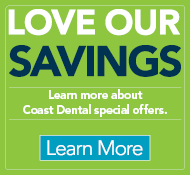 Across Coast Dental, we are committed to providing excellent customer service and quality dental care – every patient, every time. We strive to enhance our patients’ experience through office improvements, new services, and our team of caring dental professionals who have dedicated their actions to helping others. How do we measure how well we are doing? We ask our patients! We call it CoastConnect. 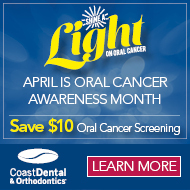 Each month, we receive hundreds of Coast Dental reviews from real patients. Our dentist office reviews are uploaded weekly so you can see how we are earning our star rating. We’re proud that nine out of ten patients give us an excellent dentist rating. Many of our best dentist reviews are written by people who have been coming to Coast Dental for years. That’s the greatest compliment of all. Our purpose is to provide quality care and comfort that exceeds our patients’ expectations, and we want to have the best dentist reviews in the country. We appreciate and thank you for reading our Coast Dental reviews with confidence that every single one was written by a real patient. We look forward to helping you smile, too. The staff are very friendly and dr Adawit is accommodating and explains every single procedure he does on me that I can understand. He has a soothing voice that is calming. I was very pleased with the office personnel and the dentist and my treatment plan. The dentist was very professional and explained everything to me in depth and i very much appreciate his professionalism and sense of gentleness with my daughter. She felt welcomed and that’s the experience every kid needs to entail. Had to wait but they had an emergency, I loved the atmosphere and the employees were friendly and the Dr. was young and very nice and professional. What a wonderful experience seeing Dr. Wendy Vienneau and staff! Pleasant, happy, prompt and over the top staying late to accommodate me! The best! It's obvious everyone enjoys what they do at this location and they do it very well! We have now been going here for several years. We are a family of 5 and are very satisfied. We would definitely recommend! The front office staff and hygienist are fantastic!!! Love them. Nice people and good place to take care of your dental needs.The hygienist Sherina Canty and the X ray lady where very professional in executing their task.I will be referring some refriends and family to coastal dental. walked in without appt and was able to see Dr. with only a short wait due to sore tooth. Dr. Lewis is amazing. He is very compassionate and friendly. He is particularly nice about making sure you have no pain. His staff Tammi , Jessica and Anet are wonderful too! The dental assistant I had is so sweet and caring!! No one "enjoys" going to the dentist however, my visit was as great as a dentist visit can be. The staff is lovely & they made an unbearable event, tolerable. I'm now a patient for life! The staff is very friendly and the hygienist is gentle as well has very informative regarding current situation of teeth and options for improving them. Everyone is courteous, professional and polite. Great communication. Dr. Windom is an excellent dentist. I could not be more pleased with my service. Staff was very nice 5. Stars. Hygienist was very nice and friendly. She explained the treatment plan and what a bridge was. . The dentist was great.